Can’t make it to the Memphis NABC? You can join in the fun — and win big — from the comfort of your own home. There’s no need to get out of your PJs when you play in the NABC Robot Individual, a three-day stratified (Unlimited/2000/500) online event hosted by BBO. NEW: Section awards have just been added. A 50% increase in masterpoints! BBO hosts several practice tournaments before each NABC Robot Individual. Practice tourneys are free and some even award points and prizes! Plan your play for a time that works best for you. Unlike previous events, the 2019 NABC Robot Individual will be held over the weekend (Saturday-Monday) making it more convenient than ever. Also, you’ll have up to 18 hours a day to complete the boards — more time to play! SPRING 2018: The overall winner was a Strat B player with 1300 masterpoints. You don’t have to be a pro! Registrations will open in early July, at BBO. Subscribe (email or BBO notifications) and we’ll send you a reminder. Regular entry fee is $50. A discount will be available for early registrations. All participants receive a $6 coupon valid for the next event (if you played in the Spring 2019 tournament, you already have one!) Coupon is valid only for same BBO username and ACBL number). Only current ACBL members can participate in the main event, so make sure BBO has your ACBL member number and your membership is active (join or renew no later than 3 p.m. Eastern on Friday, July 14 so we have time to process your ACBL membership). All the Spring practice tourneys are over. Subscribe (email or BBO notifications) and we’ll notify you before the Summer practices start! Can’t wait for the practice tourneys? No problem: BBO offers ACBL Daylong tournaments every day. With only 12 boards, they are a great routine to prepare for the NABC Robot Individual. I really liked this challenge and would play it again, time permitting. Each board is available for replay, and you can compare your actions to the bids and plays of other players, providing a great tool for analysis and improvement. BBO features GIB robots, which play a custom 2/1 system. Check the robot system notes. The robots sometimes deviate from notes if simulations lead them to alternate conclusions. The robot’s understanding of what a bid means can be seen by hovering over the highlighted bid. If the bid is not highlighted, it means the robots have no special understanding or conventional definition. Get acquainted with the GIB bots! 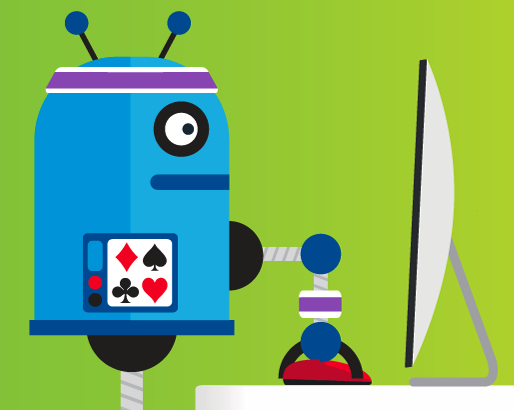 Visit the “Robot World” in BBO and play in one of the different tournaments, like the new ACBL Daylong. 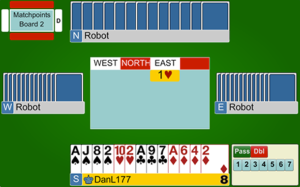 If you are looking for some informal practice, just rent three robots to play some hands.